Image caption Indian mango shipments to the EU were suspended in May after fruit flies were found in consignments. 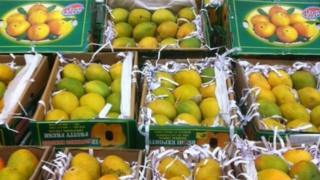 A ban on Indian mango imports into the European Union is to be lifted, clearing the way for them to return to the UK and other member states. However, other foodstuffs such as Indian aubergines, two types of squash, and a type of leaf used in cooking will remain restricted. Indian mango shipments to the EU were suspended in May after fruit flies were found in consignments. A European Commission committee voted to lift the ban on Tuesday. There had been "significant improvements" in India's mango export system, the European Commission said after the unanimous vote. The UK government previously said it was working towards the ban being lifted and was one of the member states that participated in the vote to lift the ban. "We have been working closely with our Indian and European counterparts to resolve the issue as quickly as possible and I am pleased that trade in mangoes will resume," said the Minister for the Natural Environment, Lord de Mauley. "Today's decision demonstrates the marked improvements India has made to its export system and it is important that these standards are maintained so that trade can continue and UK plant health remains protected," he said. The EU decision has come as a big relief in this rural district about 325km south of Mumbai close to the border with Goa. It's surrounded by lush green mango farms and famous for Alphonso mangoes, also known as the 'king of fruits'. Even though India sells only a fraction of its mangoes abroad, Europe is a significant market for the industry. One farmer told me his profits had more than halved after prices came crashing down. With the ban lifted, he and others like him are hoping that they will be able to compensate for at least some of the losses that they suffered last season. Mr M Rafeeque Ahmed, president of the Federation of Indian Export Organisations, said the ban had affected India's exports of fresh fruit. Exports fell from $307.4m between April and November in 2013, to $291.4m in the same period last year. UK mango importer Monica Bhandari said customers would welcome the lifting of the ban. "Customers are going to be delighted," she told the BBC. "Those who buy mangoes, who were up in arms, really, about the mango ban, have been missing them all season." The Indian mango season is from April to around June, she said. Imports will be able to start again in about a month's time, once new EU legislation has been formally adopted and published by the European Commission. However, imports of four other products - aubergines, bitter gourds, snake gourds and patra leaves - remain suspended subject to sustained improvements in plant pest control.